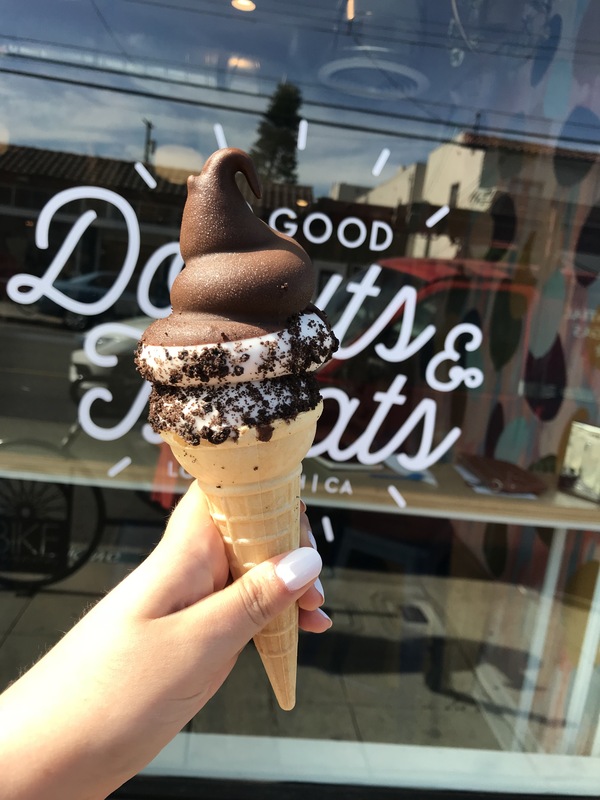 Following a slight rebranding, Do Good Donuts and Treats, previously Do Good Donuts, is serving soft serve ice cream. The name change encompasses Do Good Donuts and Treats’ new menu and welcomes a new group of customers: vegans. The small shop on Long Beach’s retro row, 4th Street, has recently expanded their menu, serving two ice cream flavors per week, one vegan and one traditional. Unlike most vegan ice creams, this ice cream does not leave a gritty residue on the mouth. Instead, it is soft and luxurious, assuming the same texture as traditional ice cream. While the ice cream is certainly a dessert, it is not overpoweringly sweet and the simple ingredients shine through. To top it off, the ice cream can be served in a cone, which is crispy and has a small nugget of chocolate on the bottom, similar to a Drumstick. Also, most of Do Good Donuts and Treats ice cream toppings are vegan. Vegan Vanilla Ice Cream with a Chocolate Shell and Oreos. While soft serve ice cream is typically viewed as a summer treat, Do Good Donuts and Treats will be serving ice cream all year round. “I am so excited to make fall and winter flavors like pumpkin, gingerbread, and maple,” Lee said. Flavors are set to alternate each week. In addition to soft serve ice cream, Do Good Donuts and Treats is introducing extended hours for the summer. Donut making will stop every day at 6 p.m.; however, soft serve ice cream will continue to be served until close the remainder of the week (Tuesday-Thursday and Sunday: 11 a.m. to 8 p.m. and Friday and Saturday 11 a.m. to 9 p.m.).